Forever Manchester’s annual Summer Social raised an incredible £3,440 at Revolution Deansgate Locks on Friday 5th August. We had a great mixture of Forever Manchester staff, ambassadors and supporters in attendance, all creating a great summer atmosphere. Even better – the sun decided to join us! Dean Mac performed on the evening, playing his delightful neo-soul covers of modern classics. His music perfectly complemented the summer atmosphere and, if you attended on the night and enjoyed his music, be sure to keep updated with his music on Soundcloud or Twitter. We also had the very talented live sketch artist Gemma Parker drawing our lovely guests. A massive thank you also goes to our gorgeous venue, Revolution, who kept us well fed and watered (!) with a BBQ and welcome drinks, as well as our generous raffle prize donors: Hotel Football, Revolution and The Fitzgerald. 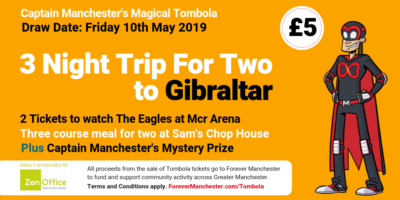 Thanks again to those that attended – the money raised will now go towards helping local people doing extraordinary things together across the ten boroughs of Greater Manchester.